The fold over bag is a new design for Scaramanga. Watch this quick video to get a closer look at this amazing bag! A contemporary take on a traditional tote is what makes our LouLou Leather Tote bag pretty incredible. This rich chestnut colour of leather makes a statement of elegance and like all our bags, this large tote bag is made from high-quality leather and craftsmanship. 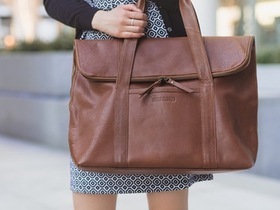 Your leather tote bag is sure to last for years to come. This bag can be used as a work bag, travel bag or even an everyday bag, giving you the multifunctional tote that you've always wanted! The main compartment has enough room for all of your essentials as well as overnight clothes. Whether you are carrying all of your work essentials or travel favourites, this bag will be the best friend you've always hoped for. Add our leather trifold smartphone wallet to your collection.The middle section is designed for up to a 15cm smartphone, but can easily be used for more notes, paper or cards. Closes with a hidden magnetic fastener. This is a great way to keep your small essentials in a secure way so you can focus on enjoying your new tote bag. Finish this leather bag off with a personalised bag tag. We offer our bag tags free of charge as an alternative. Due to the size of the bag, we refrain from personalising directly on to the leather. Take a look at our personalisation service on our website and choose from a range of our font sizes and colours. Please note that personalisation costs £10-£15, only the bag tag is free.